Our Snaptop mint dispenser with logo is a product from our new sweets and confectionery department here at Calendar Lady Promotions. The new design in polythene and metal mint dispensers, with a secure lid fastening providing a simple, elegant print area, featuring laser engraving too. Filled with triangular shaped mints. 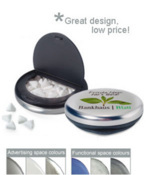 Why not browse through all our other personalised products besides our Snaptop mint dispenser with logo click here. To find out more about our Snaptop mint dispenser with logo click here and fill in the contact form and we'll get straight back to you.